It’s fuel quality that has brought the biodiesel industry to where it is today. And Scott Fenwick, the National Biodiesel Board’s technical director told attendees of the Biodiesel Vehicle Showcase Event at the conference that the National Biodiesel Accreditation Program (NBAC), better known as BQ-9000, a cooperative and voluntary program for the accreditation of companies that produce, test, and supply biodiesel fuel, serves as a key link between the industry, the producers, the blenders and marketers with the consumers. “Up until today, we’ve had programs in place for producers, marketers and independent labs doing that testing. Today, a new program for BQ-9000 retailers will be the last remaining cog to that continuum of fuel quality,” Scott said. 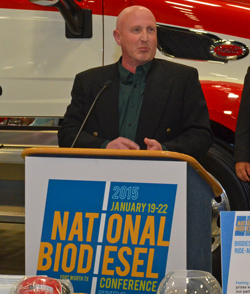 He added that more than 90 percent of the biodiesel produced comes from BQ-9000 producers. NBB’s partners in the biodiesel industry wanted this new BQ-9000 Retailer Program to make sure consumers get the appropriate industry specifications when it finally goes into their fuel tanks. The program will be forwarded to all NBB member companies for comments for 30 days, with a final review and release of the findings later in March.